For GAMES, PUZZLES, SPORTS, & PASTIMES, click here. For another BIRD book or two, click here! Wells, Seth Youngs. Millennial praises, containing a collection of gospel hymns, in four parts; adapted to the day of Christ's second appearing. Composed for the use of his people. Hancock: Pr. by Josiah Tallcott, jr., 1813. 12mo. viii, 288, [4 (adv.)] pp.  First edition of the very first Shaker hymnal, including the text without music for 140 hymns. The work also has the distinction of being the first book from a Shaker press, having been preceded only by broadsides and pamphlets. That the Hancock printers were still learning their art is evident by the at times wobbly impression of the type, the sudden shift to a smaller point size in part of the table of contents, etc. But it is a noble effort. This work appeared during the period of American Shaker history when attention was expended on codifying Shaker beliefs and practices. This is the first attempt to codify the hymnal. “I Believe She Was Not Only a Good Woman, but Good in an Eminent Degree” Wesley, John. An extract of the life of Madam Guion. 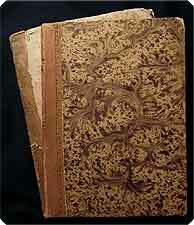 London: Printed by R. Hawes, And sold at the Foundry ... & at the Rev. Mr. Wesley's Preaching-Houses, 1776. 12mo ( ). 230 pp.  Madam Guyon (Jeanne Marie Bouvier de La Motte Guyon, 1648–1717) was a French mystic and an advocate of Quietism. Here Wesley extracts portions of her autobiography, first published in English in 1772, and in his comments he “corrects” her doctrinal and other “errors,” especially those associated with her mysticism — at the same time delivering the unequivocally approving comment of our caption. “The grand source of all her mistakes was this, The not being guided by the written word. She did not take the Scripture for the rule of her actions: at most, it was but the secondary rule” (p. vi). For a little more of (mostly the “litest”) EROTICA, click here. Lappish Devotionals  Rare, by Our Tracing Wexels, Wilhelm Andreas. Rokkus-ja oappo-girje. Samas jårggaluvvum. Kristianiast: Kr. Gröndahl lut prenttijuvvum, 1840.  f., 209, [1 blank] pp.  Devotional exercises in Lappish. This translation of “Bønne-og leerebog,” excerpted from Wexels's Andagtsbog, was done by Niels Joachim Christian Vibe Stockfleth. NUC Pre-1956 locates only one copy; RLIN adds no others. Wharton, Edith. Ethan Frome. London: Macmillan & Co., 1912. 8vo (18.8 cm, 7.4"). , 195, [1 (blank)] pp.  Early U.K. issue of the first edition of one of Wharton’s most widely read novels, though possibly not the most representative of her works; critically acclaimed from its first appearance in 1911, Ethan Frome has been in print continuously ever since, and has become a staple of the Western literary canon. This printing has a cancel title-page dated 1912 instead of 1911, and is the first English printing to incorporate several text corrections as described by Garrison, but is otherwise identical to the Scribners issues of 1911, and shows the expected type batter in “wearily” on p. 135, line 21. Wheatley, James. An extract of the life and death of Mr. John Janeway. London: John Paramore, 1783. 12mo (19 cm, 7.5"). 40 pp.  Originally printed in 1749, this piece was excerpted and edited by James Wheatley from James Janeway’s Invisibles, realities, demonstrated in the holy life and triumphant death of Mr. John Janeway. John Janeway was a Puritan scholar who died at an early age; his brother’s account of his religious experiences was considered exemplary reading for quite some time, and went through numerous editions. "General Reading" & Inexpensive, click here. White of Savannah OPINES as to England White, Joshua E. Letters on England: Comprising descriptive scenes; with remarks on the state of society, domestic economy, habits of the people, and condition of the manufacturing classes generally.... Philadelphia: M. Carey (pr. by William Fry), 1816. 8vo (23.5 cm, 9.4"). 2 vols. I: xv, , 358 pp. II: xi, , 324 pp.  First trade edition, following an issue of the same year privately printed for the author, here in an uncut copy in the original paper-covered boards. White, an American “of Savannah,” provides his impressions of British culture in London, Oxford, Birmingham, Leeds, Liverpool, and elsewhere in England — with many comparisons to the contemporary state of affairs in the United States. BEFORE His Falling-Out with the Wesleys — Travels in Georgia Whitefield, George. A journal of a voyage from London to Savannah in Georgia. In two parts. Part I. From London to Gibraltar. Part II. From Gibraltar to Savannah. [bound with the same author's] A continuation of the Reverend Mr. Whitefield's journal from his arrival at Savannah, to his return to London. London: Pr. for James Hutton, 1739. 8vo. ff., 38 pp.,  f. London: Pr. for James Hutton, 1739. 8vo. 55, [1 (blank)] pp.  George Whitefield (1714–70), a Calvinist preacher who had also been an early follower of the Wesleys during the nascent years of Methodism, was a prime mover in the Great Awakening in the English colonies in American during the second quarter of the 18th century. The present works recount his travel to and in Georgia in aid of the Wesleys' efforts there; the Continuation offers half a dozen pages speaking to time spent in Ireland. Fifth edition of the Voyage from London and second edition of the Continuation. “I Never Did Pretend to These Extraordinary Operations of Working Miracles” Whitefield, George. The Rev. Mr. Whitefield’s answer, to the Bishop of London’s last pastoral letter. London: Pr. by W. Strahan for J. Oswald, 1739. 8vo (20.6 cm, 8.1"). 27,  pp. (without half-title and final adv. leaf).  First edition: The Rev. Whitefield's reply to Bishop Edmund Gibson, who had rebuked Whitefield for presenting himself as an “enthusiast” who received direct revelation from God. Whitefield (1714–70), a Calvinistic Methodist whose friendship with John Wesley ended over theological disputes, was a controversial evangelist, a prolific sermonist, and a prime mover in the American Great Awakening of the mid-18th century. Here he not only rebuts Gibson's charges, but also accuses the Church of England of preaching false doctrine. For PHILOBIBLON PUBLICATIONS, click here. Literature, Philosophy, Politics — Americana! Wieland, Christoph Martin, ed. Der teutsche Merkur. Weimar : Im Verlag der Gesellschaft, 1774–76. Small 8vo (19 cm; 7.5"). 1774: 2 vols. (of 4). II:  f., 365,  pp. III: 397,  pp. 1775: 2 vols. (of 4). I: 286 pp.,  f.,  ff. of original wrapper. II: 286 pp.,  f.,  ff. of original wrappers. 1776: 2 vols. (of 4). I:  f., 290 pp., 4 plates II: 310 pp. ff., 3 plates.  In this monthly journal of criticism and original German literature, three monthly issues constituted a volume. Present here for 1774 are vols. 2 and 3 (April–September), for 1775 are vols. 1 and 2 (January–June), and for 1776 also 1 and 2. The volumes for 1775 have retained their original green paper printed wrappers. The plates in the 1776 volumes are essentially frontispieces, being engraved portraits of Johann Geiler von Kaisersberg, Johannes Fichard, Wilibald Pirckhaimer, Sebastian Brandt, Ulrich von Hutten, and Hans Sachs. Political coverage is secondary to the literary and philosophical content here, but in the 1776 volumes the coverage for England is almost exclusively devoted to America. The journal's editor, Wieland (1733–1813), was a complex figure of the German Enlightenment: a poet, novelist, political theorist, and pedagogue. His critical review/journal was of considerable influence. Provenance: Duplicates (with no markings) of the Harold Jantz Collection (i.e., ex–Duke University). The Anonymously Published First Editon — A Change in Direction forWieland [Wieland, Christoph Martin]. Musarion, oder die Philosophie der Grazien. Ein Gedicht, in drey Büchern. Leipzig: Bey Weidmanns Erben und Reich, 1768. 8vo. 96 pp.  As a writer, Wieland (1733–1813) evolved and changed course multiple times. The Adventures of Don Sylvio is his first novel, all previous endeavors having been poetry, and it dates from his post-pietistic stage during which his works show the influence of English and other writers. Clearly Cervantes is paramount here, but other influences that scholars have found shaping the characters of the romance are Fielding's Tom Jones, Richardson's Joseph Andrews, and even Shakespeare's Merchant of Venice. Wieland's poetry of the late 1760s and early 1770s, offering light and graceful romances, had great appeal among the public. In Musarion, here in the anonymously published first edition, he explores the nature of love and advocates a rational unity of the sensual and spiritual. An interesting work by this German Enlightenment writer. “Love, When We Met, 'Twas Like Two Planets Meeting.” Wilcox, Ella Wheeler. Poems of pleasure. Chicago: W.B. Conkey Co., (1902). 8vo (19.7 cm; 7.75"). 158 pp,  ads.  A collection of poetry by Ella Wheeler Wilcox, known for her optimistic and plainly written rhyming verse. She is probably best remembered as the author of the immortal “Laugh, and the world laughs with you; / Weep, and you weep alone”; though never favored by critics, she enjoyed an enormous readership and the adoration of many who found resonance in her positive spirituality. This is a later edition, the first having appeared in 1888. It includes a black and white frontispiece of Wilcox and the poems are divided into three sections: Passional, philosophical, and miscellaneous. Binding: Maroon cloth stamped with intertwined gilt thorny vines bearing gilt edged green leaves, stems terminating in black-stamped roses. 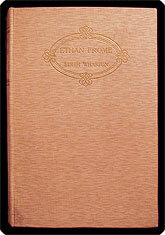 Binding unsigned; same design with different-colored leaves used on the author's Maurine. Orthopaedics Wilhelm, Philipp. Uber den Bruch des Schlüsselbeines und über die verschiedenen Methoden denselben zu heilen. Würzburg: Gedruckt bey Carl Wilhelm Becker, 1822. 8vo (21.5 cm, 8.5"). 87,  pp. ; 2 fold. plts.  Young Dr. Wilhelm (1798–1840) discusses fractures of the clavicle and their treatment, and in one of the two large folding lithographic plates illustrates a device for supporting the area of the body connected by muscle and sinew to the clavicle in order to speed recovery. Searches of NUC and WorldCat locate only three U.S. libraries (CtY, DNLM, PPCP) reporting ownership. Provenance: 19th-century stamp of the Medic. Chirug. Bibliothek Altenburg (on front wrapper and title-page, but NOT on plates). Most recently in the residue of the stock of the F. Thomas Heller bookselling firm (est. ca. 1928). Puritan Thought on the CATECHISM Willard, Samuel. A compleat body of divinity in two hundred and fifty expository lectures on the Assembly's shorter catechism wherein the doctrines of the Christian religion are unfolded ... and a great light thereby reflected on the present age. Boston: Pr. by B. Green & S. Kneeland for B. Eliot & D. Henchman, 1726. Folio (35 cm, 13.75"). , iv, 3, , 666, 581–914,  pp. (pagination erratic, skips 160–76); complete as issued.  First edition of the Rev. Willard's collected sermons on the Westminster Shorter Catechism, originally delivered as monthly lectures over 20 years' time. This posthumously printed volume opens with an account of the author, written by the Rev. Ebenezer Pemberton; Willard, one of the last of the great orthodox Puritan preachers of New England, was a clergyman noted for his opposition to the Salem witchcraft trials and for serving as acting president of Harvard between the tenures of Increase Mather and John Leverett. Evans notes that this is “the first folio volume, other than Laws, and the largest work up to this time printed in the United States.” This was a subscription printing, and includes Benjamin Franklin's father and brother, among other dignitaries, in its list of names; the sheets came from several different presses, and thus “it has fallen out . . . that the Pages for a considerable way, are numbered over again” (p. 666). The title-page is printed in red and black. The binding features a very unusual 18th-century repair job: to reinforce the joints, an early hand stitched along either side of the front joint and part way down the back. Provenance: Title-page with inked ownership inscription of T. White, dated 1726, and with inked presentation inscription to Susanna White, dated 1782. Front pastedown with inked inscription of Timothy Badger, 1782; also with 19th-century institutional bookplate and presentation inscription. *INTERESTING* BINDINGS, click here . Williams's First Published Poem Williams, C.K. A day for Anne Frank. Philadelphia: The Falcon Press, 1968. 8vo (29.8 cm, 11.75"). pp. ; illus.  First edition of Williams's first published work: a poetic meditation inspired by the horrors of the Holocaust, with illustrations based on photographs of concentration camp victims. The volume was designed by Eugene Feldman and Sarah J. Williams, and printed by Feldman; this is one of 1000 copies issued. H.D., Hemingway, Stein, Marianne Moore, & So Many Others Were His FRIENDS Williams, William Carlos. The autobiography of William Carlos Williams. New York: Random House, © 1951. 8vo (21.5 cm; 8.5"). xiv, 402 pp.  Signed copy (on the front free endpaper) of the first edition, first printing of Williams' account of his life, friendships, and accomplishments. Avant Garde Artists & Writers, 1951 Williams, William Carlos. [cover title] The Living theatre. Stein, Picasso, Eliot. [New York]: No publisher/printer, . 8vo (23.5 cm; 9"). 16 pp., plus wrappers.  This is the original prospectus/program for the inaugural season of The Living Theatre, an effort of Judith Malina and Julian Beck: It was probably the first experimental theater collaborative in the United States, and this pamphlet presents a varied and veritable “who's who” of those involved in the exercise: The initial season's performances took place in the Cherry Lane Theatre in Greenwich Village. The fore-matter offerings here are: “On Picasso's Desire and T.S. Eliot's Sweeney Agonistes” by J[udith?] M[alina? ]; “Reply” by William Carlos Williams; and “In response to a request for a manifesto on music, 1952" by John Cage. Curiously, this group of avant garde artists apparently did not feel sufficient solidarity with the working man to have the program printed at a union shop. In fact, it has the feel and look of an “in house” production. WorldCat finds only five copies. Deluxe Comedic Production, Deluxe Binding Wills, William Henry, ed. Poets' wit and humour. New York: D. Appleton & Co., 1861. 8vo (22.8 cm, 9"). , 278,  pp. ; illus.  First U.S. edition: “Illustrated with one hundred engravings from drawings by Charles Bennett and George H. Thomas.” The work was edited by a friend and collaborator of Charles Dickens; from Chaucer to Swift to “Saint Anthony's Sermon to the Fishes,” Wills's comic selections are delightfully entertaining, and their wood-engraved illustrations equally amusing. Binding: Publisher's deluxe black calf, covers and spine elaborately embossed and stamped in blind and gilt with central vignette of a cherub dressed as a jester and playing a lyre. All edges gilt. The embossing plaque is signed with the designer's initials: “R.D.”  Robert Dudley. This is an English publisher's binding, most likely done using the English sheets with an Appleton title-page. This work is rarely found in the deluxe binding: The handsomely gilt-stamped publisher's cloth is the norm. AMERICAN ORNITHOLOGY [Wilson, Alexander]. [drop-title] The loss of the pack; to which is added The pack's address. [Paisley: G. Caldwell, 1868?]. 16mo (15 cm, 5.88"). 8 pp.  A pair of poems about wandering peddlers and their gear (that is metaphorically to say, their burdens in life — primarily poverty and thwarted love), written in a heavy Scots dialect. The Scottish-born Wilson (1766–1813 ) was briefly a packman himself, before emigrating to America and achieving fame as an ornithologist. He first published The Loss of the Pack in 1795; the publication information for the present copy is suggested by WorldCat. For a BIRD book or two, click here! A SCARCE Labor of Love Wilson, Douglas. The story of Little Rabbit. [London? : 1973]. Oblong 8vo (15.5 cm, 6.2"). ff. ; col. illus.  Artist's book: A self-produced fable apparently (and touchingly) aimed at consoling a little girl after the departure of her pet rabbit. The text is printed on translucent pages overlaying Wilson's hand-colored lithograph illustrations. This limited edition was hand-printed by Wilson. It is numbered copy 11 of just 21 printed, and signed by the creator on the front free endpaper. “They Also Selected a Specimen of Money-Wort” [Wilson, Lucy Sarah Atkins]. A visit to Grove Cottage for the entertainment and instruction of children. London: J. Harris & Son [printed by Cox & Baylis], 1823. 16mo (17 cm, 6.875"). 56 pp. ; 4 plts., illus.  Attributed to Lucy Sarah Atkins Wilson by the Bodleian Library, these nature stories for children begin with an engraved title-page with an interesting border and a wonderful vignette of a large country house and grounds. The metal-engraved plates and metal-engraved title-page are all dated 1 July 1823; each elegant plate has two illustrations. Provenance: 19th-century ownership signature of Ashton Case on front pastedown; opposite on the front free endpaper, “Mama's present to dear Emily, Nov. 27th 1823.” Most recently in the children's book collection of Albert A. Howard, small booklabel (“AHA”) at rear. Polynesia & Tahiti — 7 Maps & 6 Plates — Absorbing Narratives Wilson, William, ed. & illus. A missionary voyage to the southern Pacific Ocean, performed in the years 1796, 1797, 1798, in the ship Duff, commanded by Captain James Wilson. Compiled from journals of the officers and the missionaries; and illustrated with maps, charts, and views ... London: Pr. by S. Gosnell for T. Chapman, 1799. 4to (28.5 cm, 11.25"). , c, 420,  pp. ; 7 fold. maps, 6 plts.  First edition. This account of a mission to Polynesia and Tahiti (funded by the London Missionary Society) supplies, it must be said, much more by way of the missionary travellers' interested observations of lands and people's exotic to them than it does reports of the proselytizations they pursued; it was compiled by chief mate William Wilson from his own journals and those of Captain James Wilson. Dr. Thomas Haweis, co-founder of the London Missionary Society, edited the work and the Rev. Samuel Greatheed provided (anonymously) the “Preliminary discourse; containing a geographical and historical account of the islands where missionaries have settled, and of others with which they are connected.” The Hill catalogue says, “The narrative is fresh, although sometimes naive, and provides a glimpse of everyday life on the islands that the mariner or naturalist didn't consider worth reporting.” There is a most interesting Appendix, also, canvassing everything from native dress to houses to dances to cookery to canoes to marriage and the place of women to funeral customs — not forgetting human sacrifice and sports. The volume is illustrated with six plates and seven oversized, folding maps, and includes an extensive list of subscribers. 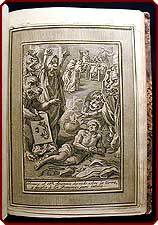 An inferior, less expensive edition appeared in the same year, printed by Gillet; the present example is sometimes identified as the Gosnell edition to distinguish it from the Gillet production. & for more RELIGION, click here. “It Shall Be My Endeavor Not to Exhaust My Reader's Patience in the Preface” Wines, E.C. Two years and a half in the navy: Or, journal of a cruise in the Mediterranean and Levant, on board of the U.S. frigate Constellation, in the years 1829, 1830, and 1831. Philadelphia: Carey & Lea, 1832. 12mo (18.5, 7.25"). I: xi, , 247,  pp. II: x, , 244, [36 (adv.)] pp.  First edition of Wines' first published book, detailing his travels through the Mid-Atlantic, Spain, Italy, Turkey, and more — drawing on his previous correspondence for reference. New Jerseyan Enoch Cobb Wines (1809–79) served on the U.S. frigate Constellation as schoolmaster to the midshipmen. Following his journey, he spent time as a teacher in Philadelphia before becoming an American Congregational minister and working to reform the prison system as secretary to both the New York Prison Association and the National Prison Association, while publishing in each of those areas. A sizable section of advertisements follows the text of vol. II. Evidence of Readership: A 19th-century borrower of this book from the Institute of 1770 library has added snarky commentary, a correction, and one accent in ink to four leaves of text and one endpaper; a more recent author has added two marks and one word in pencil. Provenance: A bookplate engraved by Bird for the Institute of 1770, a social club at Harvard University, covers a previous bookplate on the front pastedown of each volume, along with a red and white shelving label that covers a small blue label. For NEW JERSEYANA, click here. A Glimpse of Public Policy from the Dutch Golden Age Witt, Johan de. 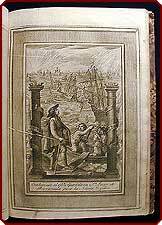 Resolutien der heeren Staten van Hollandt ende West-Vriesland van consideratie, ende oock voor de toekomende tyden dienende, genomen zedert den aenvangh der bedieninge van den Heer Johan de Witt ... beginnende met den tweeden Augusti 1653. ende eyndigende met den negentiende December 1668. Utrecht: Willem vande Water, 1706. 4to (25.3 cm; 10"). ff., 635, 638–828,  pp.  Johan de Witt was one of Europe's greatest statesmen of the 17th century: Appointed the “councillor pensionary” (i.e., the political leader) of Holland (1653–72), he successfully led the United Provinces in the First and Second Anglo-Dutch wars (1652–54, 1665–67) while at the same time effectively consolidating the country's position as a formidable commercial and naval power. This text with a sizable subject index records de Witt's public resolutions from 2 August 1653 to 19 December 1668 on a variety of topics, including the price of gold, the East India Company, and England. In the dedication, vande Water, the printer of this work, notes that he is producing it so that the documents will not be lost to the future. Evidence of Readership: Notes referring to specific pages written on front free endpaper and a newspaper clipping dated 25 April 1926 laid in text. For BOOKS IN DUTCH, click here. Bible Dictionary for “the Methodist Connexion” Wood, James. A dictionary of the Holy Bible. New York: D. Hitt & T. Ware, 1813. 8vo (22 cm, 8.625"). 2 vols. I: 600 pp. II: 616 pp.  Sole American edition, this being the state with the title-page showing Hitt and Ware as publishing it for “the Methodist Connexion in the United States.” First printed in England in 1804, James Wood (1751–1840), a Methodist minister, largely based this encyclopedic dictionary of the Bible on that of Augustin Calmet. The Envious DOG & the Ermine [Wynne, John Huddlestone]. Tales for youth; in thirty poems: To which are annexed, historical remarks and moral applications in prose. London: Printed by J. Crowder for E. Newbery, 1794. 8vo (17 cm, 6.75"). x (i.e., viii), 158,  pp. ; 1 plt., illus.  Verse and prose on conduct of life — explained via emblems and fables — fill this volume of Christian literature for children. The copper-engraved frontispiece is by Thomas Cook and the 30 half-page rectangular wood-engraved headpieces are by John Bewick. Provenance: Early 20th-century bookplate of James Rolt; most recently in the children's book collection of Albert A. Howard, small booklabel (“AHA”) at rear. [IN ITALIAN] Ximénez, Mateo. 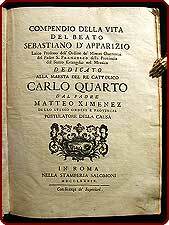 Compendio della vita del beato Sebastiano d'Apparizio, laico professo dell'ordine de' Minori Osservanti del Padre S. Francesco della provincia del Santo Evangelio nel Messico. Roma: Stamperia Salomoni, 1789. 4to (24.2 cm, 9.5"). xvi pp., port., 228 pp.,  f. [with] Coleccion de estampas que representan los principales pasos, echos, y prodigios del Bto.. Frai Sebastian de Aparizio, relig[ios]o. franciscano de la provincia del S[an]to Evangelio de Mexico. Dispuesta por el R.P. Fr. Mateo Ximenez. Roma: por el incisor Pedro Bombelli, 1789. 4to (23.5 cm, 9.125"). Engr. title,  of  plts.  From humble carter to revered and beatified lay Franciscan is not an easy course to pursue in life, but Sebastián de Aparicio (1502-1600) accomplished it in Mexico. Although he was married multiple times, he is said to have remained chaste, deciding in 1574 to abandon his secular lifestyle for that of a lay Franciscan. 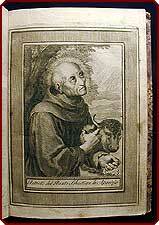 He is said to have had great ability to manage and calm animals, including near-wild bulls. His life was filled with teaching, begging, and accomplishing near-impossible things. 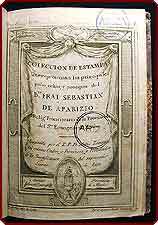 Offered here is the first edition of Ximénez's biography and the fine album of plates illustrating events in Aparicio's life (see our caption, above). Finding the “life” and the volume of plates together is uncommon. Only by happenstance did the two volumes come to us within months of one another, from two different continents, allowing us to marry them for this offering. For example, in the U.S., only the Lilly and Bancroft Libraries report owning both works. There is some question as to the number of plates in a complete copy of the Colección: Some sources call for an engraved title-page and 128 plates, while others call for 129 plates. There seems not to have been an edition of the Vita in Spanish. Or for more ILLUSTRATED BOOKS, click here. From Ape to Zebra, Illustrated by Anderson The young child's A B C, or, first book. New York: Samuel Wood (pr. by J.C. Totten), 1806. 32mo (9.8 cm, 3.8"). 16 pp. ; illus.  Uncommon first edition of the first children's book ever published by Samuel Wood, described by Rosenbach as responsible for “many thousands of children's religious, instructive, and nursery books.” This simple, alphabetically themed reader is internally illustrated with woodcuts of birds, animals, and objects, along with one person: Xerxes. Later editions altered some of the cuts, but Xerxes seems to have been a constant. Rosenbach attributes all of the illustrations to Alexander Anderson; Pomeroy doesn't dispute that but is only comfortable attributing nine to him. From Ape to Zebra The young child's A, B, C; or, first book. New York: Samuel Wood & Sons, No. 261, Pearl-Street; Samuel S. Wood & Co. No. 212, Market Street, Baltimore, [ca. 1820]. Square 8vo (10.5 cm, 4.13"). 16 pp.  First published in 1806, this little abecedarium was the first children's book ever published by Samuel Wood, whose work included “many thousands of children's religious, instructive, and nursery books.” (Rosenbach) The alphabet in this later edition is illustrated with variations on the fine wood engravings of birds, animals, and objects included in the first, except for the portrait of Xerxes, which seems to have been a constant throughout the many editions. Alexander Anderson, America's preeminent wood engraver, is thought to have supplied the illustrations to the original edition. The front wrapper wood-engraving on this copy shows three young boys playing with a spinning top, and the rear features a swarm of bees buzzing around a honey pot. Provenance: From the children's book collection of Albert A. Howard, small booklabel ("AHA”) at rear. Shaker “Statement” Youngs, Benjamin Seth. The testimony of Christ's second appearing; containing a general statement of all things pertaining to the faith and practice of the Church of God in this latter-day. Albany: E. & E. Hosford, 1810. 12mo. xxxviii, 620,  pp. Click the image to the right for an enlargement. Peruvian Conquest Illustrated Zárate, Agustín de. Histoire de la decouverte et de laconquete du Perou. Traduite de l'Espagnol...par S.D.C. Paris: La compagnie des libraires, 1716. 8vo (17 cm, 6.75"). 2 vols. I: Frontis., , 360 pp. ; 13 (2 fold.) plts., 1 fold. map. II: , 479, [1 (blank)] pp.  Early French printing of this very successful Peruvian history, which went through numerous editions in languages including Spanish, Italian, Dutch, German, and English. Zárate arrived in Peru as part of the retinue of the first viceroy, and served there from 1543 until 1548. 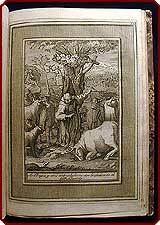 His work was first printed in its original Spanish in 1555, but did not appear in French until 1700; the present translation was done by S. de Broë, Seigneur de Citry et de la Guette. 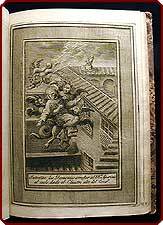 The first volume is illustrated with an oversized folding map and fourteen engraved plates, including the well known depiction of a nattily dressed European gentleman, reclining on a raft-like cushion, borne across a stream by two Indians. Married set: The two contemporary bindings are similar but not identical; both are of mottled leather, one more coarsely grained (and acid-etched) than the other, while one has floral and the other pomegranate motifs gilt-stamped in spine compartments. The match was made by a previous, Spanish-speaking collector, who has left pencilled notes in Spanish in both volumes. For more SETS, click here! A Polyglot Dictionary of American Indian Languages Zeisberger, David. Zeisberger's Indian dictionary: English, German, Iroquois — The Onondaga, and Algonquin — The Delaware. Cambridge: John Wilson & Son, 1887. 4to (27.5 cm; 11"). v, [1 (blank), 236 pp. 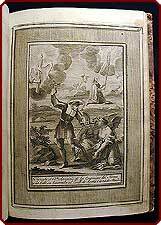  “Printed from the Original Manuscript in Harvard University Library.” Zeisberger was an 18th-century Moravian missionary among the native Americans named in the title of this work. He left this polyglot dictionary in manuscript and it is here printed for the first time. Edited by Eben Norton Horsford. From the Chinchilla to the New Holland Cereopsis . . . Illustrated & Educational! Zoological Society of London; Edward Turner Bennett, ed. The gardens and menagerie of the Zoological Society delineated. Chiswick: Printed by Charles Whittingham for Charles Tilt, 1831. 8vo (22 cm, 8.625"). 2 vols. I: xii, 308 pp. ; illus. II: viii, 328 pp. ; illus.  An illustrated and encyclopedic survey of the animals held by the Zoological Society of London, organized into two volumes, one for quadrupeds and the other for birds. Each animal's entry is illustrated with a wood engraving of the subject drawn by William Harvey, one of Bewick's favorite pupils, and engraved by Branston and Wright but “assisted by other artists”; plates are signed G.B., S.S., T.W., or J.J. There are also occasional whimsical vignettes depicting more colorful occurrences, such as a cherub playing with a jaguar and her cubs. Bennett (1797–1836) — remembered for bringing four living giraffes to London, among other accomplishments on behalf of the Zoological Society — designed this work with a nonscientific audience in mind. This is the first edition, with the variant title-page (tipped in) giving Tilt as publisher as opposed to Thomas Tegg, N. Hailes, and John Sharpe. Provenance: From the library of American collector Albert A. Howard; small booklabel (“AHA”) at rear of each volume. And/or browse our . . .